Cool if not downright cold temperatures are normal for much of the United States at this time of year. To deal with those colder temps, you’ve pulled out your heavy sweaters, winter coats, boots, gloves and flannel sheets. But what about your pets? What do you do to get them ready for winter? While there’s still time before serious amounts of snow fly or an arctic blast reaches into the Deep South, we’ve compiled some winter pet care tips to help keep your furry friends comfortable and safe. Many dogs and cats can tolerate most cold-weather conditions — as long as they have time to acclimate to the chillier temperatures. If you consistently walk your dogs outside as summer gives way to fall and winter, they will naturally adjust to colder weather. But if your pets spend most of their time indoors or in warmer climates and you plan on taking them someplace cold for the upcoming holidays, you’ll need to gradually introduce them to and shelter them from those colder temperatures. Extreme cold and sub zero wind chills are always exceptions, even with conditioning. It can simply get too cold for even the hardiest snow-loving dogs to spend long periods of time outside without proper shelter and nutrition. All pet owners should be aware that their dogs and cats can develop cold-weather-related health problems, including frostbite and hypothermia, once temperatures fall below 20 degrees Fahrenheit. What about outdoor cats? Some outdoor cats can be transitioned to living indoors during cold winter months. However, you’ll need to start the transition several months before really cold weather sets in. For those cats who only feel safe outside, you’ll want to provide them with a warm, dry shelter that has clean, dry bedding. They’ll also need drinkable, fresh water, so consider using an insulated bowl to help delay freezing in addition to checking the water bowl frequently. Staying warm during cold weather requires a lot of energy (calories), so you may need to provide more food than you normally do during spring and summer months. Be sure to talk with your veterinarian about your outdoor-only cats’ nutritional needs and if you should switch them to a food that’s high in protein and fat such as Diamond Naturals Active Cat Chicken Meal and Rice Formula. Don’t forget to bundle up! Just as you invest in sweaters and down coats to keep warm, you may need to buy cold weather apparel for your dogs. Sweaters or coats can be especially helpful for short-coated dogs whether they’re being walked or being allowed outside to relieve themselves. If possible, you’ll want to get your pets accustomed to wearing a jacket or sweater before cold temperatures arrive so that they’re comfortable being dressed. Pet clothes to help keep outdoor cats warm are not a good idea. Cats generally don’t tolerate wearing coats and sweaters. Clothing could also put outdoor cats at risk for injury if it catches on something in their outdoor environment. Winter cold and snow can be tough on paw pads, so paw care becomes even more important during cold months. Be sure to rinse (or at least wipe) and dry your dogs’ feet after each trip outside, especially if they’ve been walking in areas where deicers have been used. You’ll also want to monitor your dogs’ paws for ice or snow that collected between the toes and for cracks in the paw pads. A pet-safe balm applied to pads can help prevent dryness and cracking. Waterproof booties, if your dogs will wear them, offer the best protection for paw pads and provide traction on icy surfaces. Protective paw wax is also available and can provide a semipermeable barrier between paws and salty sidewalks. 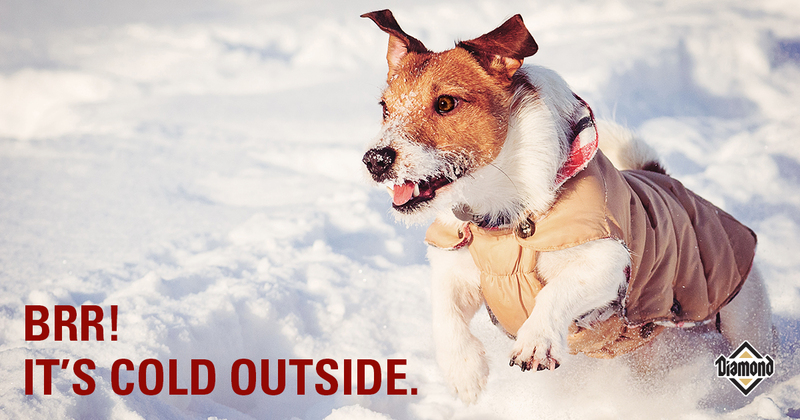 When it comes to winter pet care, be sure to plan ahead. Dogs and cats aren’t any more immune to cold weather than we are. If it’s cold for you, it’s cold for them!